Revlon just posted a new coupon link up on their Facebook Page for $1/1 Any Revlon Beauty Tools that you can print HERE. 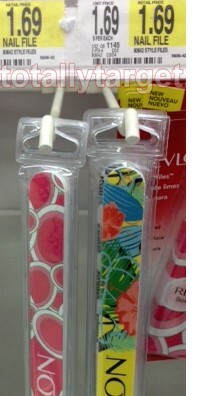 Target Carries Revlon regular Emery board Nail Files for as low as $1.27, so you can grab yourself some pretty cheap nail files after this coupon. Or you can pick up some fancier colorful single nail files like the ones in my picture for just .69 cents after this coupon. Check your inserts too- you may be able to save your ink if you have the following coupon: $1/1 Revlon Beauty Tool 6-24-12 SS x8/31.